The ultimate crowd-pleaser, nachos were invented in 1943 by a maître d’ in Piedras Negras, Mexico (just south of the Texas border). Ignacio “Nacho” Anaya, working a solo shift at the Victory Club restaurant, cobbled together a pile of tortilla chips topped with melted cheese and pickled jalapeños for a group of U.S. military wives in for a snack. His creation became hugely popular, paving the way for massive concession-stand revenues across America. Preheat oven to 400°. In a large frying pan over medium-high heat, brown steak and chorizo, stirring, about 5 minutes. Meanwhile, chop onion and mince garlic. Add onion and all but 1/8 tsp. cumin to pan. Stir often until onion is soft, 4 to 5 minutes. Reduce heat to medium; stir in 1 1/2 cups salsa. Simmer until thick, 8 to 10 minutes, stirring occasionally. While steak mixture simmers, combine black beans, 3/4 cup water, oregano, 1 tsp. garlic, and chiles in a small saucepan. Bring to a boil over high heat, then reduce heat to medium and simmer until all but about 1/4 cup liquid has evaporated, 10 minutes. Meanwhile, make guacamole: Pit and peel avocado. In a bowl, mash avocado with remaining 1 tbsp. salsa, remaining 1/8 tsp. cumin, remaining garlic, and the lime juice. Stir 1 tbsp. cilantro into guacamole and add salt to taste. Line a large, rimmed baking pan with parchment paper. Arrange chips in a 12-in.-wide circle. Sprinkle with cheese. Bake until cheese melts, 3 to 4 minutes. 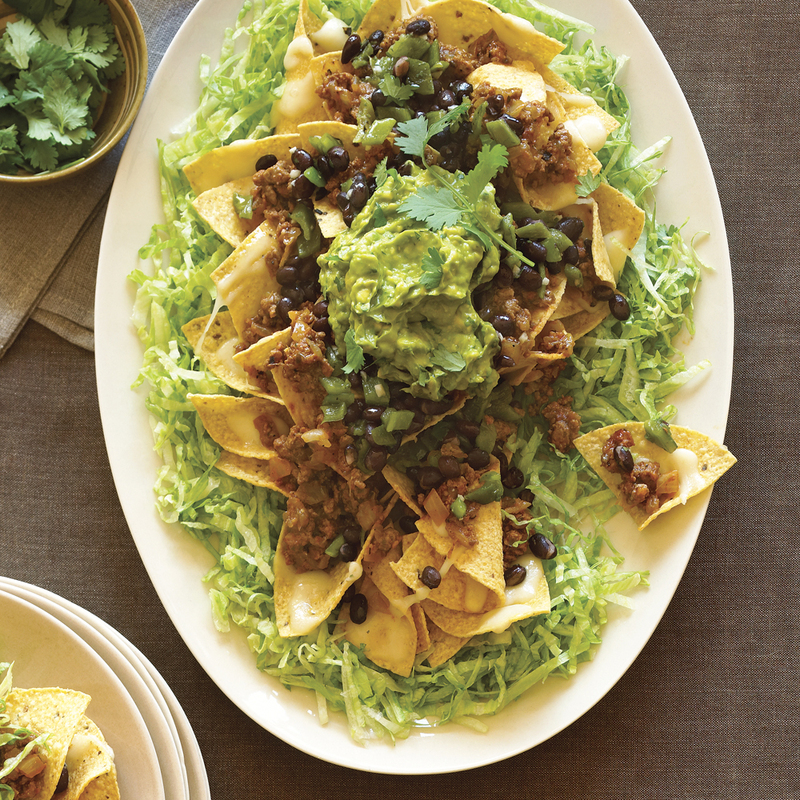 While chips are baking, arrange lettuce around rim of a large serving platter (at least 16 in. wide). With a wide spatula, loosen chips from parchment. Carefully lift parchment from pan, then slide chips off paper into center of platter. Spoon meat mixture over chips. With a slotted spoon, top with beans. Spoon guacamole over center of nachos and sprinkle with remaining 1 tbsp. cilantro.